Should We Restore The Divine Name To More Common Use? "According to this prayer, the first priority for Jesus' followers is that God's name be sanctified...."
However, then Dunn adds: "In the Hebrew Bible,...the name shem (name) of Yahweh ...may be used as an alternate name of Yahweh himself." Really? We can substitute "the name" for Yahweh? Why? Dunn means that in writing, the scribes replaced Yahweh with Shem ("The Name") (or Adonai, "Lord"), but Yahweh was there originally. Dunn blesses this translation suppression of Yahweh's name, as we shall explore here. However, Dunn's notion that dominates all translations is contrary to the Bible instructions to teach God's name. It takes the duty to honor God's name too far. "The things that become idols most easily are not, in and of themselves, bad things. The danger of Christian idolatry isn't a tendency to put bad things before God. The danger is taking good, wonderful God-given or God-created things and giving them a greater importance than God [Yahweh]." Id., at 1-2. More similar discussion of this topic can be found at: The Divine Name & NT. Yet, consider that according to Charles Ryrie, author of Ryrie Study Bible, Yahweh’s Name appears in Hebrew manuscripts of the Old Testament exactly 6,823 time. See, Ryrie, Charles. Ryrie Study Bible Expanded Edition (Moody, 1995) at 6. Despite this amazing fact, the name “Yahweh” doesn’t appear even once in the text of the three most popular Bible English translations of the Original Testament on the market today. Thus, the King James Bible, the New American Standard Bible, and the New International Version do not have God’s Name ever disclosed and clearly identified. Biblical scholars have failed sadly to make better known that these texts' omission is explained by mimicking the unbiblical use of "Shem" (NAME) or the substitution of ADONAI (LORD) by Jewish copyists beginning in the 300s to the present. This has led to our ignorance of God's true name of "Yahweh." in the NT era. Thereby, Christians have forgotten the name Jesus was elevating -- YAHWEH. Alas, the good reasoning of these translators fell on deaf ears. Almost no translation today includes God's name despite its clear presence in the Hebrew text - except the public domain World English Bible Version (Yahweh) and Young's Literal (Jehovah). How did this still prevalent error to suppress Yahweh's name come about? Later, it came to be believed writing down YAHWEH could lead one to also speak the name, and this was disapproved of. Hence, in the 3d-4th century, Jewish and also Christian scribes began eliminating the name of Yahweh from texts that once had the name present. This has spiritual repurcussions. God tied His promises, His covenant, His Law, and salvation to His Name. Moreover, He commanded us to know His Name, to seek His Name, to bless His Name, and to share His Name with everyone. For discussion on this, see PDF by Neil Snyder, His Name is Yahweh. Most Bible scholars and Hebrew linguists believe that “Yahweh” is the correct way to pronounce God’s Name. The Y-a-h in His Name sounds like “Yah,” and the w-e-h in His Name sounds like “way.” That said, considerable debate persists about whether to enunciate the second syllable in God’s Name with a “v” sound or with a “w” sound, but compelling evidence proves that the “w” sound is correct. See Encyclopedia Judaica, The Interpreter’s Dictionary of the Bible, Unger’s Bible Dictionary, The Jewish Encyclopedia (Volume 12), the Encarta Encyclopedia, or Clover, R. The Sacred Name Volume I (Third Edition, Qadesh La Yahweh Press, Garden Grove, California, 2002) chapter 9. For more discussion on the correct pronunciation, see this Wikipedia article. The early Christian scholars who inquired what was the true name of [God] had therefore no great difficulty getting the information they sought. Clement of Alexandria (died circa 212) says that it was pronounced iaove.” [In Greek, the V shaped letter sounded as a U sound, and was known as upsilon.] Epiphanius (died 404 AD) who was born in Palestine and spent a considerable part of his life there gives IABE (one codice IAVE). [B = Beta in Greek, and also had a v sound.] Theodoret (died circa 457 AD) born in Antioch writers that the Samaritans pronounced the name IaBe (in another passage IABAU)...[B = Beta in Greek.] This direct testimony is supplemented by the magical texts in which IaBe as well as IaBa, occurs frequently. In an Ethiopic list of magical names of Jesus, purporting to have been taught by him to his disciples, YAWE is found. Finally there is evidence from more than one source that the modern Samaritan priests pronounce the name YAHWEH or YAHWA. There is no reason to impugn the soundness of this substantially consistent testimony to the pronunciation of Yahweh or Jahveh, coming as it does through several independent channels....Recent scholars, accordingly, with few exceptions, are agreed that the ancient pronunciation of the name was Yahweh (the first H sounded at the end of the syllable.” (“Jehova,” Encylopedia Brittanica (1911) Vol. 15 at 312.) See likewise New American Encyclopedia (Dodd, Mead and company, 1918) Vol 12 at 625. Thus, it appears in transliterated English, it is YAHWEH. One of the most detailed explanations to support Yahweh (where "w" is sounded as "oo") is the correct pronunciation is "Is The Correct Pronunciation Known," ch. XI, pp. 104-14 in PDF from The Sacred Name (Yahweh Press). See page 114 of the same. Most scholars believe "Jehovah" to be a late (ca. 1100 CE) hybrid form derived by combining the Latin letters JHVH with the vowels of Adonai, but there is some evidence that it may already have been in use in Late Antiquity (5th century). It was not the historical vocalization of the Tetragrammaton at the time of the redaction of the Pentateuch (6th century BCE), at which time the most likely vocalization was Yahweh. The historical vocalization was lost because in Second Temple Judaism, during the 3rd to 2nd centuries BCE, the pronunciation of the Tetragrammaton came to be avoided, being substituted with Adonai "my Lord." Jewish sources on pronunciation agree it is Yahweh. TheJewish Encyclopedia of 1901, Volume 12, page 119, states: "It thus becomes possible to determine with a fair degree of certainty the historical pronunciation of the Tetragrammaton, the results agreeing with the statement of Ex. iii. 14, in which YHWH terms Himself . "I will be", a phrase which is immediately proceeded by the fuller term "I will be that I will be," or, as in the English versions, "I am" and "I am that I am." The name is accordingly derived from the root (= ), and is regarded as an imperfect. This passage is decisive for the pronunciation "Yahweh"; for the etymology was undoubtedly based on the known word." "The true pronunciation of the name YHWH was never lost. Several early Greek writers of the Christian Church testify the name was pronounced 'Yahweh.' This is confirmed, at least for the vowel of the first syllable of the name, by the shorter form Yah, which is sometimes used in poetry (e.g., Ex. 15:12), and the - yahu or -yah that serves as the final syllable in very many Hebrew names." "YAHWEH, the proper name of the God of Israel; it is composed of four consonants (YHWH) in Hebrew and is therefore called the Tetragrammaton..." The Universal Jewish Encyclopedia, Volume 9, page 160, confirms this fact again: "Of the names of God in the Old Testament, that which occurs most frequently (6,823 times) is the so-called Tetragrammaton, YHWH ( ), the distinctive personal name of the God of Israel." For an opposing point of view that says Yahweh is truly Yah-hu-way, see HaShem website. Between the years 500 A.D. and 1000 A.D., vowel markings were invented and introduced in the Hebrew language. To prevent Jewish people from accidentally saying Yahweh, the rabbis decided to place the vowel markings for the word “Adonai” (which means lord) or "Elohim" on the Tetragrammaton -- “YWHW.” When Elohim is overlayed, it produced a word with this sound: YeHoVah. But when ADONAI is placed over it, ADONAI's vowel's come out: "YAHWEH." In 1520 A.D., a Bible scholar named Galatinus [FN 1] called God by the name “Jehovah” [FN2] and in 1611 A.D., the translators of the original King James Bible explained in a footnote that God’s Name is Jehovah. That’s why so many people today believe that God’s Name is Jehovah. According to The Jewish Encyclopedia (Singer, Isadore, ed. 12 vols. KTAV Publishing House, Inc., 1964, vol. 7, p. 88), Galatinus was the confessor for Pope Leo the 10th. Many, if not most, Bible scholars believe Galatinus was the person responsible for interpreting the Name “Yahweh” as Jehovah. However, there is some controversy about this question. No matter who made this step, we know the name Jehovah did not come into use until at least the 1400s A.D. There is good reason to re-insert the Name of God -- YAHWEH -- into the English Translation, and the Greek text too for that matter. First of all, the Greek Septuagint had the Name of Yahweh in it from the very beginning. Though this fact was at one time widely doubted by scholars, substantial fragments of the Original Testament in Greek (the Septuagint) have surfaced since then, and they do have the Name preserved in ancient paleo Hebrew, amidst the text that is otherwise Greek. Photographs of these fragments can be seen in this 'Kingdom Interlinear Translation of the Greek Scriptures' from the Jehovah Witnesses. These photographs are a powerful testimony to the reverence the ancients had for the Name. 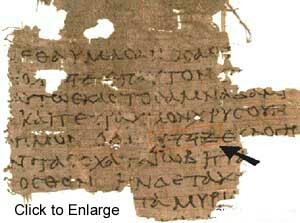 See photo of manuscript 4Q120 from 140 BC in Septuagint at this Wikipedia article Tetragammaton. Incidentally, it is ironic that Jehovah Witnesses preserve the very proof that the name is YAHWEH, yet their group still uses in its name an anachronism (i.e., Jehovah) caused by a hasty conclusion of Galatinus in 1520! Wonders never cease! Continuing with our point, Howard explains that the Hebrew Matthew that he restored proves likewise that Yahweh was the original text in the New Testament wherever HaShem was used in reference to God in the Hebrew versions. When you are preparing your English translation of the Bible, it's perfectly acceptable to use God's name Yahweh in the Original Testament (OT). You can do it nearly 7000 times. That's how often the four consonant tetragrammaton appears in the original Hebrew. Using God's name in the New Testament is a different matter. It is a bolder move, and not without controversy. Ancient manuscripts of the Original Testament (OT) in Hebrew contain the divine name, but ancient manuscripts of the New Testament Greek do not. Yet, this can be explained because when the Infallible Name Doctrine arose by the third century, it would deliberately seek destruction of texts that preceded it that had YHWH in the text. And thus by either deterioration or deliberate sanctimonious destruction, none of the NT texts prior to the third century exist. And this explains why no NT text survives with YHWH in the text. See Surviving Manuscripts of New Testament. When the OT was translated into Greek in 257 BC in the Septuagint, there were placeholders used for YAHWEH's name. These evolved over time, and yet line up with the oldest NT manuscripts, as we shall see. Unfortunately, in the end, KYRIOS (or Lord) replaced these earlier placeholders in 300s for both the Septuagint and NT editions. Hence, later versions of the Septuagint OT make those passages where YHWH appear simply identify "Lord" and now it is impossible with such translation to distinguish between whether it is Messianic prophecy about Jesus as "Lord" or instead that is a passage about God Almighty. And passages in the NT became equally impossible to distinguish the Lord God from the Lord Jesus when the same change was imposed on our NT scripture. "Recent discoveries in Egypt and the Judean Desert allow us to see first hand the use of God's name in pre-Christian times [i.e., the earlier Septuagint versions]. These discoveries are significant for New Testament studies in that they form a literary analogy with the earliest Christian documents and may explain how NT authors used the divine name. In the following pages we will set forth a theory that the divine name, YHWH [Howard uses the Hebrew characters] (and possibly abbreviations of it), was originally written in the NT quotations of and allusions to the Old Testament and that in the course of time it was replaced mainly with the surrogate abbreviation for Kyrios, "Lord" [Again, he uses the Greek characters]. This removal of the Tetragram[maton], in our view, created a confusion in the minds of early Gentile Christians about the relationship between the 'Lord God' and the 'Lord Christ' which is reflected in the MS tradition of the NT text itself." Not only did the removal of the Tetragrammaton create that confusion, but also now those who wish to uphold the Theodosian Trinity of 381 AD have a motive to resist restoring the original sense of YAHWEH in various passages. The truth is Jesus is divine by the indwelling of the Logos ("dwelt among us" John 1:14) --- even though the "Logos is not mine, but my Father's who sent me." (John 14:24.) But to say Jesus is YAHWEH, translated as Lord in the Septuagint, goes beyond John's prologue or the original usage in the NT. So when a non-Jehovah Witness advocates we use Yahweh's name in honor, we hear that it is awfully suspicious that it's the Jehovah Witness Bible that uses Jehovah in the New Testament. Doesn't that mean they're writing their own doctrines into the Bible? No, it doesn't. What it means is that Witnesses love the divine name and so they highlight facts that are not highlighted (if not actually buried) by those who don't love the name. Since the name appears some 7000 times in the entire Bible, it's hard to argue that God doesn't want it known. Especially in view of these verses. that men may know that thou, whose name alone is YAHWEH, art the most high over all the earth. In fact, should not Christians be identified with that name? [Peter] hath declared how God at the first did visit the Gentiles, to take out of them a people for his name. "The Vatican, saying the name of God deserves more reverence, earlier this summer instructed that Catholics stop using the word Yahweh in worship, a step that is expected to affect a number of hymns, according to the Catholic News Service. And now comes Christianity Today, the evangelical magazine, talking with Protestants about the issue. One of several perspectives reported in the article: "Protestants should be following their lead, said Carol Bechtel, professor of Old Testament at Western Theological Seminary in Holland, Michigan. 'It's always left me baffled and perplexed and embarrassed that we sprinkle our hymns with that name,' she said. 'Whether or not there are Jewish brothers and sisters in earshot, the most obvious reason to avoid using the proper and more personal name of God in the Old Testament is simply respect for God." Thus, we are being told again that "out of respect for God" we should not utter His name -- Yahweh. Just call Him God, and don't get too personal -- that is what Catholicism and Protestant leaders are saying. This is the revival of the Ineffable Name Doctrine under a new rubric. It is sad, for it violates the words of the Bible itself to proclaim the name and make it known. And thus the doctrines of men replace the commands of God -- again! Fortunately, Standford Rives in his reconstruction of the Original Gospel of Matthew -- volume three of his series -- which is hosted free on our site -- restores Yahweh to the places it was found in the oldest Hebrew versions of Matthew. See our link. Did Jesus Get Condemned as A Blasphemer For Using God's True Name? As explained below here, it is reasonable to infer that Jesus actually used Yahweh's name in His response to the Sanhedrin question whether He was Messiah. Instead of saying He was the Son of Man sitting on the right hand of "Power," as it reads now, it appears what Jesus actually said was he would be seated "on the right hand of Yahweh." Why? Because there is nothing blasphemous in saying one is sitting on the right hand of Power. But the Sanhedrin had a rule -- preserved in later texts -- that it was blasphemy to utter the "secret name" of God. Hence, once you know that fact, and the later influence of editors of the NT to remove Yahweh's name, then you can infer what Jesus truly said was he would sit on the "right hand of Yahweh," not simply "Power." And thus this reference to Yahweh was eliminated, with all the other uses of Yahweh in the NT due to the Ineffable Name Doctrine contaminating the copyists to scorn writing the allegedly 'secret name' of God. Let's go through the analysis as succinctly as possible. First, Jesus in John says to the Father, "I made your name known." John 17:26. So that means we will not be surprised if we find a text that is best explained by Jesus uttering the name Yahweh. Second, the Mishna Sanhedrin VII, 5 (compiled about 200 AD)(see link) reads: ‘The blasphemer only incurs guilt if he utters the secret name of God." Here is the link to a Word document of the entire part VII from a site that has a repository of the Sanhedrin legal documents called the Mishna Sanhedrin. As we read it today, there does not appear to be any insult on God's name. His name is not used. The punishment that the Sanhedrin would pass could not be a death penalty unless Jesus / Yashua actually spoke the name Yahweh. This is true either under Leviticus 26 or the Sanhedrin's recognized construction of that passage. Hence, it appears that the reason Jesus / Yashua was executed was precisely because He used the name of Yahweh, and due to evolving views of the Ineffable Name Doctrine, just saying the Name was considered sinful. But for Jesus / Yashua doing so, our Lord would not have been executed. And hence our Lord was killed for making the Name Yahweh known to the Sanhedrin who were already influenced by a perniscious Ineffable Name Doctrine that would silence even Jesus for using the Name. Hence, this supports the view that we should take the risk to make the true name of God known -- Yahweh. "It is often pointed out that the technical definition of blasphemy in Mishnah (Sanhedrin 7:5) requires that to be guilty a person must pronounce the name of God, the Tetragrammaton, often translated as Yahweh today. Because there is no evidence that Jesus ever defied that prohibition, some scholars argue the Evangelist displays considerable ignorance of first-century Judaism." Yet, we can now see that we can infer that the evidence of what Jesus actually said was removed by copyists adhering to the Ineffable Name Doctrine. And thus Jesus did use the Name, and this is what garnered the finding of blasphemy, because the Sanhedrin had evolved the notion that use of the name, without the necessary 'curse' upon God set forth in Leviticus 24:15-6, was itself blasphemy. Often overlooked, four of the most common Divine Placeholders for God’s names and titles were used in this passage [of Galatians 1:1]. The [letters #1] and [letters #2] represent: "Messiyah, the Implement of Yah," "Yahushua," meaning "Yah Saves," "Yahweh," or "Elohym-God," and His favorite title "’Ab-Father," based upon the first word in the Hebrew lexicon. Examples of placeholders not used in this particular verse, but ubiquitous throughout the rest of the Renewed Covenant, and universally found in every first-, second-, third-, and early fourth-century Greek manuscript, describe the "Ruwach-Spirit," the "’Edon-Upright One," and the "Upright Pillar." And Placeholders for "Mother" and "Son," like "Father" are also common, but not universal. While codices dating to the first three centuries differ somewhat among themselves, and differ significantly from those composed after the influence of General Constantine, the use of Divine Placeholders is the lone exception to scribal variation among the early manuscripts. These symbols for God’s name and titles are universally found on every page of every extant codex written within 300 years of Yahshua’s day, without exception. But, nonetheless, they are universally ignored by Christian translators, writers, and preachers. By including them here in the text, as all of the Renewed Covenant authors themselves did, it is incumbent upon us to correct 1,700 years of religious tampering and corruption. The very fact that these placeholders are found on all of the more than one-hundred manuscripts unearthed prior to the mid fourth-century, tells us that it wasn’t a regional or scribal choice. Instead, they convey something so profoundly important that they were purposefully inscribed throughout the original autographs—in the texts penned by the authors of the Renewed Covenant. And so while these manuscripts all differ from one another with regard to their wording; the only constant is the one thing every translator has ignored. There isn’t even a footnote in any of our English translations indicating that these Divine Placeholders were universally depicted in all of the oldest manuscripts, including the codices Sinaiticus and Vaticanus. As a result, Christians do not know that these symbols existed, much less that they were later replaced by translators, substituting the very names and titles which would have been written out by the original authors had they been intended. Kappa Sigma and Kappa Upsilon, in capital letters with a line over them, were used to convey Yahweh’s name and Yahshua’s "Upright One" title, even though every English bible replaces these symbols with "Lord." The fact Kappa Sigma conveys "Yahweh," the preponderance of the time it is used, is something I discovered when translating Greek quotations of Hebrew passages cited by Yahshua and His apostles in the Renewed Covenant. This obvious conclusion has been reaffirmed recently by the publication of early Septuagint manuscripts. In them, we find a transition from writing Yahweh’s name in paleo-Hebrew in the midst of the Greek text throughout the first and second centuries, to using the symbolism of Kappa Sigma to represent Yahweh’s name beginning in the third-century. So, we now know for certain, what seemed perfectly obvious: the Divine Placeholders were used to designate Yahuweh’s name in a language whose alphabet could not replicate its sounds. Also by finding "Yahuweh" written in paleo-Hebrew in the oldest Greek manuscripts of the Covenant Scriptures, especially in those dating to the first and second centuries BCE and CE, we have an interesting affirmation that my initial rationale regarding the Divine Placeholders was accurate. Yahweh’s name can’t be accurately transliterated using the Greek alphabet, so to avoid a mispronunciation, the Hebrew alphabet was initially used, and then, after Hebrew became a dead language, Greek symbolism was substituted. Further, a placeholder for Yahweh’s name or title exists between "aletheia/truth" and "diameno/would continue to exist" in the oldest Greek text, but not in the Textus Receptus, the Novum Testamentum Graece, nor the Nestle Aland Greek New Testament, even though the first claimed to be the "text received directly from God," and the other two have claimed to have corrected every error of the former by referencing older manuscripts. "To whom we gave place by subjection, no, not for an hour; that the truth of the gospel might continue with you." Thus, any reference to "God" is gone, let alone the original reference to Yahweh. The most likely meaning of the name may be “He Brings Into Existence Whatever Exists" -literally “I will Be that I will be” (link at 4:58) but there are many theories and none is regarded as conclusive. The traditional rendering of the name, as found in English Bibles, is "I am who I am" or "I am that I am." Behold the Hand or Behold the Nail. YUD [or YOD] literally means by ideographic identification HAND. WAH [or VAV] literally means a NAIL. Simmons rejoices because YASHUA then means "Behold the Hand, Behold the Nail is our Salvation." Mr. Simmons says this elegantly is the gospel found through Ideograms. There is something to this, but not as definitive as Simmons proposes. Let's allow him to present his case. At 2:02 of the video, Simmons offers his proof. He claims the Hebrew letters have had "ideographic meanings" from ancient times. A chart of each vowel's supposed ideographic "literal meaning" appears on a chart that is displayed. At 2:03 of the video, it says you can find the chart at this link. While that link is empty as of 2018, previously in 2010 when you clicked the link for more information on the "hidden meanings" of the Hebrew letters at that page, you find there is talk of mysticism. The link page was to a page on Hebrew letters at Inner Org. While that link is empty as of 2018, in 2010 the title on the page was "Authentic Jewish Mysticism and Thought." Umm. Makes me a bit concerned. Of these, the first book is indeed the most influential in raising attention to ideograms. Frank T. Seekins -- Hebrew Word Pictures --- is perhaps accurate in part, but one cannot help but notice some strange supporters. We find a webpage that promotes his book for sale which says that "according to mystics of the Jewish tradition, the entire cosmos is said to be created from the 22 consonants of the Hebrew alphabet." ("The Hebrew Alphabet"). Umm. More concern now arises whether this is serious scholarship or hokum. Well, let's see if we can independently verify that the "ideographic meaning" of YUD is HAND, HE is "behold" or "look" and VAV/ WAV is NAIL. First, we find controversy among those who accept ideographic meanings. One who agrees with the premise of Seekins, says YUD / YOD means "closed hand," not "hand." See Logos Christian Website on God's Name. Yet, then inexplicably, he ignores the 'closed' aspect, and just treats it as 'hand." Id. It seems these meanings are applied loosely and not by some strict rules. Umm. Are we really going to find any scholars agreeing? Undaunted, our goal is to find the truth, so we will not stop there. Let's study "ideograms" or "ideographic" meanings to Hebrew letters by Google searching. Indeed, scholars agree Hebrew, like Egyptian, had ideographic representations in the shape of letters. See The Bible Dictionary (London, Paris, NY: 1878) Vol 1 at 55. The letters were themselves pictorial representations in the shape of the letter. So do we know the meaning of the words by looking at the pictures they represent graphically? Yes, indeed we do, in most cases. The only ones that Simmons's claims are supported by scholars are YOD = HAND and VAV = NAIL. As we shall demonstrate, HE has been argued to mean WINDOW but it does not mean BEHOLD, as Simmmons claimed. (Remember, it is a pictograph of a physical object, so stretching WINDOW into BEHOLD is likely the product of wishful thinking.) Also, most likely HE is a picture of a HEDGE, and has no meaning of WINDOW, and clearly not the meaning of LOOK. So the Bible Dictionary from 1878 cited above does explain that HE is both a letter and a picture-word but "the meaning of this word is uncertain." Id., at 58. It goes on and says "Gesenius conjectures it may have signified a 'window,' but Furst believes it equivalent to the Hebrew word signifying a hedge." Id. The dictionary comments that "his opinion is more probable on account of the identity of the letters He and Cheth...." Id. The "Vav" is indeed a "nail" -- the shape of which is "very well preserved in the Hebrew." Id., at 58. And "yod" is an ideograph of "hand." Id. , at 58. If you look then at a list of the Hebrew alphabet, you can see why this is reasonable -- the letters are indeed shaped to be potentially that of a hand, nail and hedge. See this link "Hebrew Alphabet." With the tantalizing fact that YWHW has the symbol letters of a HAND and NAIL in his name. I think personally that alone is supportive of YAHSHUA. We did not need to stretch HE which means likely HEDGE into WINDOW and then by an overactive imagination transform WINDOW into LOOK or BEHOLD. So the pictograph for HEDGE appears on either side of HAND and NAIL. So a THORN HEDGE, A HAND and NAIL evokes what image to you? The PASTOR of our souls leading and protecting the flock into a protective hedge done by a nail into his hand. It is still beautiful and sublime. Thus Seekins and Simmons meant well. However, it does no good to assert meanings not supported by serious scholarship. It also is an endeavor that pokes a bit close to mysticism. It is also open to multiple interpretations. My suggestion is to not make it a practice to speculate on such things. God's word is clear enough without our reading too much into things. But this HAND and NAIL meaning indeed is VERY intriguing to a follower of YAHSHUA. Could God YAHWEH have given Moses a name whose ideographic meaning points to the one the Father "indwelled," as Jesus / Yahshua said in John 14:10? That the Father's future role in humankind would be to have a Shekinah presence in the man Yahsua? Hebrew language and manuscript studies are important for an accurate understanding of the Christian Greek Scriptures. Both the Hebrew language and culture strongly influenced the Greek words and thought patterns used in the Christian Scriptures. Though the majority of the Hebrew Scripture quotations come from the Septuagint, by no means is this always true. In some instances, the writer translated directly from Hebrew to Greek when quoting Scripture. Thus, a comprehensive study of the Christian Scriptures must also consider Hebrew language documents. In the case of this present study, however, there is even greater need to become acquainted with Hebrew texts, inasmuch as verification of the divine name in the New World Translation Christian Greek Scriptures comes directly from Hebrew sources. We have looked for some agreement with us by the Hebrew versions we consulted to confirm our own rendering [of the divine name]. Thus, out of the 237 times that we have restored Jehovah's name in the body of our translation, there is only one instance wherein we have no support or agreement from any of the Hebrew versions. But in this one instance, namely, at 1 Corinthians 7:17, the context and related texts strongly support restoring the divine name. In this and the following two chapters, we will consider three topics dealing with Hebrew language manuscripts. The most widespread theory is that the Hebrew term [omitted] has the vowel points of [omitted] (adonai). Using the vowels of adonai, the compositehataf patah under the guttural alef becomes a sheva under the yod , the holam is placed over the first he , and the qamats is placed under the vav , giving ??????? (Jehovah). When the two names, ???? and ??? ?, occur together, the former is pointed with a hataf segol ? under theyod ? and a hiriq under the second he ?, giving [omitted], to indicate that it is to be read as (elohim) in order to avoid adonai being repeated. The pronunciation Jehovah is believed to have arisen through the introduction of vowels of the qere—the marginal notation used by the Masoretes. In places where the consonants of the text to be read (the qere) differed from the consonants of the written text (the kethib), they wrote the qere in the margin to indicate the desired reading. In such cases, the kethib was read using the vowels of the qere. For a few very frequent words the marginal note was omitted, referred to as q're perpetuum. One of these frequent cases was God's name, which was not to be pronounced in fear of profaning the "ineffable name". Instead, wherever ???? (YHWH) appears in thekethib of the biblical and liturgical books, it was to be read as ??????? (adonai, "My Lord [plural of majesty]"), or as ???????? (elohim, "God") if adonai appears next to it. This combination produces ??????? (yehovah) and ??????? (yehovih) respectively. ???? is also written ’?, or even ’?, and read ha-Shem ("the name"). Despite Jehovist claims that vowel signs are necessary for reading and understanding Hebrew, modern Hebrew is written without vowel points. The Torah scrolls do not include vowel points, and ancient Hebrew was written without vowel signs. The Dead Sea Scrolls: A College Textbook and a Study Guide claims the vowel points found in printed Hebrew Bibles were devised in the 9th and 10th centuries. This is discussed in "The Question ofVowels" in a Wikipedia article at this link. in the DSS version of Psalm 119 where the blue arrow appears. (Thanks eliyah.com.) The Masoretic text done in the 900s AD era uses Adonai in its place or Yahweh Adonai instead of Yahweh alone. Actually this practice was much earlier, for one of the frequent discrepancies between the Massoretic text and the presumed Hebrew Vorlage of the Septuagint is whether to read in a given passage Yahweh alone, or Yahweh Adonai. This inconsistency was occasioned by the fact that originally Yahweh did stand alone, but that Adonai tended to be introduced alongside the Tetragrammaton by way of making explicit the surrogate. This was not understood by the Massoretes, however, who felt compelled to vocalize both words. Neither was it understood by the scribes of the Qumran Scrolls, nor even by still earlier translators of the LXX. That Yahweh originally stood alone in most passages is supported by the fact that, in Hebrew poetry, the double designation of the Deity usually adds excessive length to the poetic stich. Here are some important examples where the DSS used YHWH, and not ADONAI / Lord, which now systematically purges YHWH from our view. The variants between the Masoretes' work and the DSS are identified in the footnotes to the Abegg Flint version of the Dead Sea Scroll Bible (1996) in case one wishes to compare. Incidentally, the Divine Name--YHWH--also appears in the Habakkuk Pesher (Commentary) from Cave 1 -- one of the Dead Sea Scrolls. It writes the name Yahweh in paleo-Hebrew. Id. Why then does the Abegg Flint, Dead Sea Scrolls Bible and all modern texts persist in obscuring YHWH's true name when the DSS prove it was originally present? We have to realize that translators even today try not to offend sensibilities of some by placing YHWH / or a transliteration like YAHWEH in the text. The editors know some do not want God's name written at all, let alone phonetically identified as either "Yahweh" or "Jehova" (which causes more disagreement). So rather than identify God's name at all, whether 100% accurately or a good faith alternative, God's name is not identified at all. As the Preface to the 1901 American Standard Version Bible said, this is all born of "superstition." This suppression of God's true name is thus unholy. In the Old Testament, the traditional "LORD" is used for Yahweh. Where the Hebrew Adonai Yahweh occurs, the rendering "Lord GOD" is used. Yahweh Elohim is rendered as LORD God. Most titles of God are translated in the text, with the original title placed in a footnote. ("Textual Aspects of Translation," http://isv.org/principles.php (2012). However, redacting scripture is wrong. Deut 12:32; Prov 30:6. This passage from the Dead Sea Scrolls has a few differences from the Masoretic text (as used today in all Hebrew Bibles and which most translations are based on). In the top line the word YHWH is underlined, this is the name of God. In the Masoretic text the word adonaiis used instead. In the bottom line, near the middle [of the Dead Sea Scroll Isaiah] is the word v'qara meaning "he will call". In the Masoretic text this word is written as v'qarat meaning "she will call". I don't know Hebrew, so I am reporting this here. If Mr. Benner is wrong, any reader who thinks so should notify me. YHWH. The personal name of the God of Israel is written in the Hebrew Bible with the four consonants yhwh and is referred to as the "Tetragrammaton". At least until the destructions of the First Temple in 586 b.c.e., this name was regularly pronounced with its proper vowels, as is clear from the *Lachish Letters, written shortly before that date. But at least by the third century b.c.e., the pronunciation of the name yhwh was avoided, and Adonai, "the Lord", was substituted for it, as evidenced by the use of the Greek word Kyrios, "Lord", for yhwh in the Septuagint, the translation of the Hebrew Scriptures that was begun by Greek-speaking Jews in that century. Where the combined form *Adonai yhwh occurs in the Bible, this was read as *Adonai *Elohim, "Lord God". In the early Middle Ages, when the consonantal text of the Bible was supplied with vowels points to faciliate its correct traditional reading, the vowel points for 'Adonai with one variation - a sheva with the first yodof YHWH instead of the hataf-patah under the aleph of 'Adonai7 were used for YHWH, thus producing the form Yehowah. When Christian scholars of Europe first began to study Hebrew, they did not understand what this really meant, and they introduced the hybrid name "Jehovah". In order to avoid pronouncing even the sacred name *Adonai for YHWH, the custom was later introduced of saying simply in Hebrew ha-Shem (or Aramaic Shemc, "the Name") even in such an expression as "Blessed be he that cometh in the name of YHWH" (Ps. 118:26). THE PROHIBITION OF USE OF THE NAMES OF GOD. The prohibition applies both to the pronunciation of the name of God and its committal to writing, apart from its use in sacred writings.The prohibition against the pronunciation of the name of God applies only to the Tetragrammaton, which could be pronounced by the high priest only once a year on the Day of Atonement in the Holy of Holies (cf. Mishnah Yoma 6:2), and in the Temple by the priests when they recited the Priestly Blessings (Sot. 7:6; see also Ch. Albeck (ed. ), Seder Nashim (1954), 387). As the Talmud expresses it: "Not as I am written am I pronounced. I am written yod he vav he, and I am pronounced alef dalet" (nun yod, i.e., Adonai; Kid. 71a). In the 3rd century before Christ, the teaching began among followers of Simon the Just to not speak God's true name out loud -- but do not confuse this fact with believing this was universal or dominant by the 3d century. Thus, The Jewish Encyclopedia of 1901, Volume 11, page 353, points out that this was the turning point, namely the exact time when the notion began to no longer pronounce the Name Yahweh. SIMEON THE JUST ( ): High priest. He is identical either with Simeon I. (310-291 or 300-271 b.c. ), son of Onias I., and grandson of Jaddua, or with Simeon II. (219-199 b.c. ), son of Onias II... After Simeon's death men ceased to utter the tetragrammaton aloud (Yoma 30b; Tosef Sotah. xiii.). The Babylonian Talmud, Tractate Yoma, page 39b, also verifies that it was upon the death of Simeon the Righteous, that all Israel began to no longer pronounce the Name Yahweh. The Jewish Encyclopedia Volume 9, pages 162-163, not only confirms this fact, but it shows the strict prohibition and warning to all those who do not adhere to it. The restriction upon communicating the Name proper probably originated in Oriental etiquette; in the East even a teacher was not called by name. For naming his master Elisha, Gehazi was punished with leprosy (II Kings viii. 5; Sanh. 100a). After the death of the high priest Simeon the Righteous, forty years prior to the destruction of the Temple, the priests ceased to pronounce the Name (Yoma 39b). From that time the pronunciation of the Name was prohibited. "Whoever pronounces the Name forfeits his portion in the future world" (Sanh. xi. 1). Hananiah ben Teradion was punished for teaching his disciples the pronunciation of the Name (`Ab. Zarah 17b). "The Names of God," -- photo plates of early archaelogical examples of YAHWEH. David Breetzke, Nehemiah Gordon and the Name of Yehovah (2013) - criticizes view that Yahweh is really Yehovah. There is no dispute that YHVH are the Hebrew letters for Yahweh's name. If you would like to know when they are present, regardless of the correct pronunciation, the World English Bible provides this each of the 7000 times YHVH appears. You will find the WEB at this link. When the WEB for the Original Testament is read outloud on Librivox -- available at this weblink -- it it spoken as YAHWEH. For the New Testament with the same use of Yahweh inferred where likely, the audio version of WEB is available at this weblink.